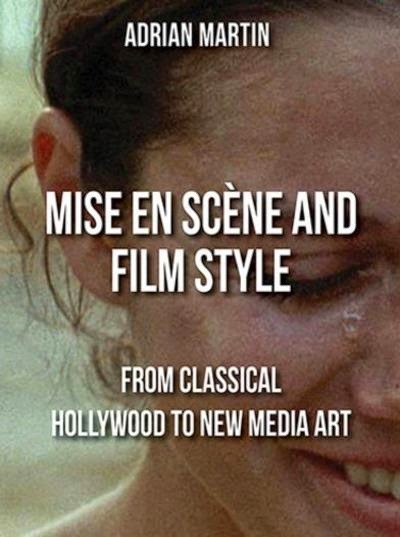 Over the last week I’ve been enjoying Adrian Martin’s new book Mise en Scène and Film Style: From Classical Hollywood to New Media Art. (Full disclosure: Adrian is a close friend; we founded and co-edit the journal LOLA together.) It’s a wonderfully ambitious and erudite work—and I’m quickly realizing that it will require multiple re-readings for me to absorb and retain its generous profusion of ideas. For the moment, let me simply try to describe, in a nutshell, the interests that animate the work. This book is trying to do at least four things. Did we collectively take a wrong turn in film studies by grasping the work of mise en scène or style in cinema as a matter – at least in the first instance – of wholeness and fluidity, of organic coherence and singular fictional worlds, of a certain ‘transparency’ or invisibility? And what would it mean, now, to shift gears and retrace our steps over the ground of mise en scène, trying to reconfigure its classic moves in a new and different way? Second, Adrian writes about being raised, as a cinephile, in a particular historical tradition of mise en scène: that of the British school of stylistic analysis that is associated with luminaries such as V.F. Perkins, Robin Wood and Andrew Britton, and publications such as Movie. He names this the “expressive school of critical analysis”. But what this school envisioned as mise en scène was (he points out) only one among many conceptions of the term. He invokes a number of far-flung critics—from Harun Farocki and Frieda Grafe in Germany to José Luis Guarner in Spain, to Shigehiko Hasumi in Japan, to Guillermo Cabrera Infante in Cuba, not to mention the original Cahiers du Cinéma critics in France in the 1950s—each of whom had something a little different in mind when they mobilized the term. The book sets out to provide a global sense of “the history and diversity of traditions in international film criticism” as it relates to mise en scène in particular and film style in general. immediate, surface level – the gestures, the moves, the rhythms, the colours – of what constitutes any mise en scène … We should be careful not to depart, too brusquely, for the ‘higher order abstractions’ that we regularly translate the evidence of our senses into: meanings, symbols, metaphors, allegories, directorial intentions, ‘world views’ … Part of the argument of this book is a plea to always attend closely and full-bloodedly to this type of materiality in cinema. There is mise en scène as the global history – still to be fully, comprehensively written – of how filmmakers made their films, what structures and effects of style they created in their work; this could be called a history of forms in cinema. Then there is mise en scène as the history (again, global) of what critics, theorists and commentators have said, written and thought in their quest to define and use tools to understand the films they see, study, analyse and transmit to others. -- The new issue of NECSUS: The European Journal of Media Studies takes "War" as its theme, and includes a special section on audiovisual essays edited by Adrian and Cristina Álvarez López. Also: a video of Adrian's lecture "Warhol's Aquarium," delivered at the Deutsches Filmmuseum in Frankfurt; and Cristina's text "Five Haunted Cities," at Fandor. -- Michael Sicinski: "The Deaths of Michael Brown and Eric Garner: Documents of Barbarism". -- Kevin Duong at Jacobin: "Conservative scholars and Catholic activists in France have been denouncing a 'theory of gender' that they believe is guiding the decisions of François Hollande’s Socialist government ... the crisis is bringing into focus ugly, neglected dimensions of contemporary French politics, touching on gender, immigration, reproduction, and the limits of secularism and universalism." -- Sad news: the new issue of the journal Experimental Conversations might be its last. -- Jonathan Rosenbaum's films of the year. Also: an updated version of Jonathan's 1976 piece, "My Favorite Films/Texts/Things"; and a post on two horror films, The Innocents (1961) and The Haunting (1963). -- The theme of the new issue of the feminist film journal Cléo is "Party! "; and the latest issue of Offscreen focuses on "gender and horror". -- Ignatiy Vishnevetsky: "Neither lost nor found: On the trail of an elusive icon’s rarest film". -- Lawrence Webb: "Remapping The Conversation: Urban Design and Industrial Reflexivity in Seventies San Francisco". (Via Catherine Grant.) See also: Catherine's Thanksgiving Roundup of dozens of links. -- Travis Wilkerson's [edit: Alex Johnston's] 5-minute video, Now! Again! (2014), "a reenactment of a classic radical film, Now by Santiago Alvarez, staged this summer in Ferguson, Missouri by the cops themselves." -- Amelia Smith: "Eyal Weizman on understanding politics through architecture, settlements and refuseniks". -- Alexander Galloway reviews Steven Shaviro's new book, The Universe of Things. Also: an interview with Steve about his book. -- There's a new issue of Desistfilm. -- Available for download on PDF: Mark Rothko's collection of essays, The Artist's Reality: Philosophies of Art, written in 1940-41 and published in 2004. -- An essay by David Brancaleone from a couple of years ago: "The Interventions of Jean-Luc Godard and Chris Marker into Contemporary Visual Art". -- Alexandra Heller-Nicholas on "Gothic Textures in Found Footage Horror Film".